In celebration of Hello Kitty’s 40th Anniversary, Sephora debuts a modern capsule of elevated beauty collectables that pays tribute to her 1974 origin and 40 year legacy. When I was at Hello Kitty Con last week, I seen the entire collection at Sephora’s booth and it was amazing! The limited-edition features colorful makeup essentials to sparkling accessories, super collection collectible, so cute you wouldn’t want to use it. 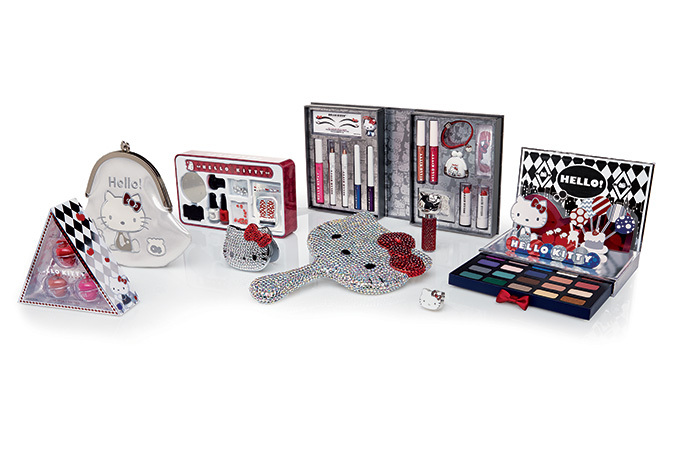 The Red Bow Beauty Diaries ($49) – This set is filled with all of Hello Kitty’s beauty essentials in one special place. Perfect your look with an assortment of color cosmetics—lip balms, lip glosses, eye shadow sticks, eye liners, liner appliqués, nail appliqués, hair mascara—and delight in a few Hello Kitty collectable gifts (an adorable figurine, mini coin purse, and hair tie). Nail Kawaii Set ($39) – Paint, stamp, sticker and embellish your tips with this irresistible box of Hello Kitty nail delights. Kawaii = cuteness, and with everything you need to decorate your nails in one collectable tin, including a nail file, polish, stamper kit, 3-D nail bling and appliqués, you can dress up your nails with endless Hello Kitty accessories. An Apple A Day Trio Lip Balm Set ($20) – Enjoy a tasty trio of adorable apple lip balms, a nod to Hello Kitty’s weight of only three apples, that nourish and hydrate while delivering intense color. Three vibrant shades, Red Delicious, Natural and Think Pink, are infused with delicious fruit extracts to satisfy your sweet tooth and color cravings. To top it all off, a tiny mirror is tucked into each lip balm—keeping easy application at your fingertips. 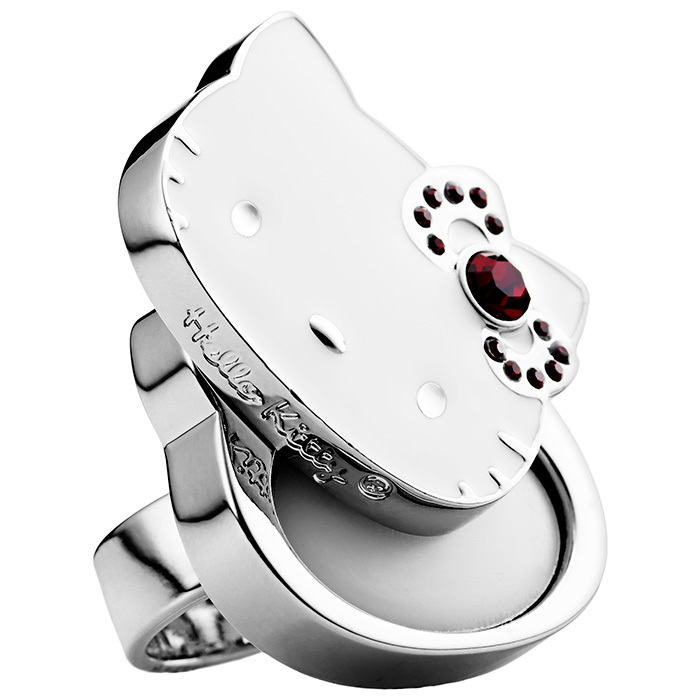 Ruby Solid Perfume Ring ($29) – Wrap Hello Kitty around your finger in a sweet-smelling perfume ring. The statement ring features a solid perfume of Hello Kitty’s original, signature scent, which embodies all her favorite things: green apple, Japanese fruits, rich florals, a musk, and a wink of vanilla. Ruby Hand Mirror ($195) – Deck out your vanity in cushion-cut cuteness when you use this dazzling 40th Anniversary Collector’s Edition mirror for your finishing touches. With over 2,000 hand-placed crystals, it brings a bit of bling to every touch up. Pop-Up Party Eyeshadow Palette ($52) – Throw yourself a party every time you open this playful palette full of chic eyeshadow shades. The palette features 20 silky, soft, and blendable shadows in an array of vibrant pops, gorgeous neutrals, and fun metallics—all named after Hello Kitty’s favorite things. Milk Money Makeup Bag ($32) – Treasure the iconic coin purse that started it all with this updated version of the very first Hello Kitty item from 1974. Now resized and reimagined to store all your favorite makeup, the classic design features a shiny silver casing with the original two-star clasp closure and luxe, modern graphics. Ruby Roller Girl Eau de Parfum ($26) – Get flirty with the original Hello Kitty scent that’s a little fruity and a little floral. The adorable, ruby-encrusted rollerball is portable and has a light, sweet scent that will make you smile from the inside out. The one-of-a-kind scent captures the essence of all of Hello Kitty’s favorite things: green apple, Japanese fruits, rich florals, musk, and a wink of vanilla. 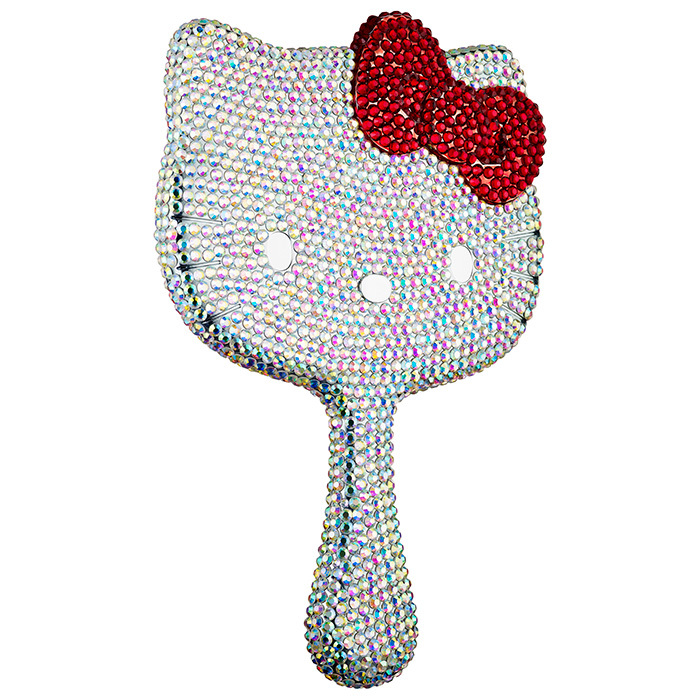 Ruby Compact Mirror ($49) – Whether you want to touch up, check someone out, or just give yourself a wink, do it in style with the Hello Kitty bling mirror. This collectable item is adorned with nearly 300 hand-placed crystals, making it the must-have addition to your purse. The 2-sided compact mirror features a regular magnification on one side and a 3x magnification on the other.